Bay Area Rapid Transit (BART) is a heavy rail system serving the bay area communities around San Francisco. The Silicon Valley BART Extension (SVBX) Project is a current Valley Transit Authority’s Design-build project which extends the BART system from Warm Springs to Berryessa. Under this contract, AVA is planning and designing facilities within the BART station campus sites. AVA is responsible for Architectural, Mechanical, Electrical and Structural Engineering services at the (2) BART station campus sites on the Silicon Valley Rapid Transit BART Extension Project, which are the Berryessa and Milpitas stations. 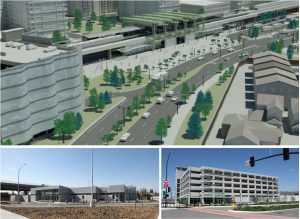 At the Berryessa station campus the work includes design-bid-build documents for the BART Police Zone Facility and Bus Transit Center canopies along with design-build bridging documents for the parking structure. The Police Zone Facility is a 5,000 SF facility serving numerous BART stations along the line. The canopies will provide shelter for patrons awaiting access to buses. The parking structure at Berryessa is an (8) level facility providing for 1,490 automobiles at the opening, and is planned for a horizontal expansion to 2690 automobiles in the future as demand increases.